Editors Note- Due to interest expressed by some, I am providing a brief explanation of the cause of this split in our group. Yesterday I chose to take a stand against disinformation and misinformation in the 9-11 movement even though I knew that if I did, it would likely mean the end of one of the most credible and effective 9-11 groups in the world. Despite being one of the original founders of Colorado 911 Visibility, and having made numerous and credible contributions to getting at the truth of what happened on September 11th, 2001, I was told by Fran Shure that I would no longer be welcome as part of the Colorado 911 group. But you see, Fran and the “Team” had a problem in kicking me out and that problem was that I own the web domain. Back in 2004 when I helped start this group, I was the only one who had the savvy to get a website going for our new group, even though I knew absolutely nothing about websites back then. I bought the domain and built our first website and have made sure domain and hosting fees for the website were taken care of for the past 9 years. Recently, Fran Shure and the “Team” have been drifting further and further down the road of 9-11 disinformation. A couple of weeks ago, I was informed through email that Fran and the “Team” had a meeting and decided to show a film featuring one of the worst, garbage filled presentations out there by a woman named Barbara Honegger who makes unfounded claims that Flight 77 did not hit the Pentagon. While this viewpoint is largely accepted by the 9-11 movement as truth, careful examination reveals that there are deep flaws in the no plane theory that cannot be reconciled by the available evidence. Fran admitted to me that she knew I was going to oppose this but the decision was made regardless. When I heard, I let Fran and the “Team” know that under no circumstances will I allow them to post any announcements at the website for this garbage. For this, I was called a dictator and control freak. I have managed to keep things “clean” for over 9 years with this group and my influence has helped to give our group credibility in the midst of a tremendous disinformation campaign. The Colorado group had made achievements beyond those from any other group in existence today because we had credibility and guarded it very closely. However, those days are over and instead of working to keep our groups’ good name, Fran and the “Team” have decided to give the movement a major black eye by leaving Colorado 911 Visibility with intentions to form a new group where they can deliver disinformation free from my “dictatorial control”. I will continue to pay the expenses of the website and keep it up as an archive of this once great and effective group. I will also publish in the days to come, a full and accurate account of these events at the website for those interested in what happened. RIP Colorado 9-11 Visibility. September 11 – The New Pearl Harbor is a five-hour documentary that summarizes 12 years of public debate on 9/11. All the most important issues in this debate are presented in great detail, showing both the positions of the “debunkers,” those who advocate for the official version, and the evidence presented by the 9/11 Truth Movement, those who reject the official version. This month, from this three-DVD set, we will show the first DVD, which will cover the air defense failure, the hijackers, and the aircraft. This is another excellent film by Italian filmmaker Massimo Mazzucco, who also gave us New American Century; Cancer: The Forbidden Cures; and The Second Dallas: Who Killed RFK? We hope you will join us for the film and the discussion afterward. Program: Details can be seen at http://www.meetup.com/GrandJunctionInfoCinema/events/145204172/. Note: If you missed the presentations by Lance deHaven-Smith last weekend, here is a very good ten-minute interview with him with Abby Martin on RT (Russia Today): http://www.youtube.com/watch?v=bm3Z-cKRMN4. 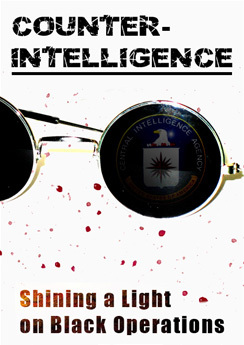 This month we will show Counter-Intelligence: Part 2 – The Deep State (1 hour 25 min.). The term “deep state” was coined by author and scholar Peter Dale Scott to designate how the power of wealth influences and controls governmental policies, as opposed to the public state, which is the ostensible decision-making structure in which we participate in our democratic republic. Each of the five parts of Scott Noble’s film Counter-Intelligence stands alone as a separate film. In the first part, we learned the history of the CIA. In this second part, we learn about the relationship of the CIA with organized crime, drug trafficking, and money laundering. We will also learn about the Iran-Contra scandal, that public officials have been unable to rein in the secret government, and that President Obama has aggressively punished more governmental whistle-blowers than all other presidents combined, even though the core purpose for the First Amendment of our Constitution is the protection of people who expose governmental misconduct. Please join us! The accolades below speak for themselves about Scott Noble’s excellent film. There will be a discussion of the film after the showing. Attention: There will be no meeting this month in Grand Junction!